Successfully Added 7 Inch Android Tablet Computer - Quad Core CPU, Mali GPU, HD Screen, OTG, Bluetooth, Wi-Fi, 2000mAh Battery to your Shopping Cart. This 7 Inch Tablet PC uses the Android operating system and with its A33CPU, Mali-400 GPU and great memory expansion options you'll never be short of space. 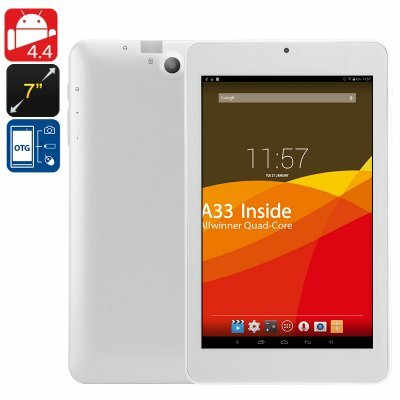 This fantastic cheap tablet PC comes at a super low price and respectable specifications. The Quad Core CPU and Mali GPU make for a strong performance that will competently handle videos and light gaming, with its 7-inch touch screen you'll be able to enjoy good sized HD images so everything is shown in picture perfect quality. At just 7 inches, this tablet is exceptionally portable and easy to take anywhere you go while still offering a good size display for surfing the web, movies, and games. With an Android operating system, there's plenty of choices when it comes to optimization and access to the Google Play store means you'll never be short on Apps or games. With a micro SD card slot you'll be able to add up to 32GB of additional storage or alternatively, you can make use of the OTG port and connect controllers or even memory pens for greater storage options and fast file transferee. This 7 inch tablet PC comes with 12 months warranty, brought to you by the leader in electronic devices as well as wholesale tablet computers..